Parents have flocked to recent screenings of the Screenagers documentary, with last night’s showing in Hobart sold out. The Tasmanian Catholic Schools Parents Council is encouraging families to sign up for a national “digital detox” that starts next month. “This is an issue parents are facing on a daily basis,” the council’s executive officer, Greg Boon, said. “Our children are growing up in a very different world to the one we grew up in — today’s world is full of new possibilities, distractions and threats. The council has joined the Australian Parents Council, a national federation of Catholic and independent school parents’ organisations, to bring the Screenagers documentary to Tasmania. 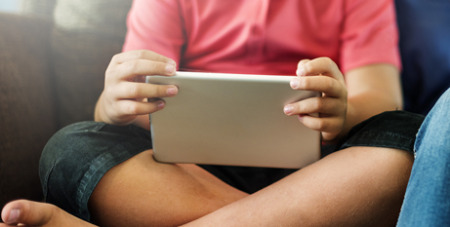 The movie is the first step in a wider campaign about to be launched by the Australian Parents Council, which is calling on parents to contribute to a national survey about the digital dilemma, and sign up for the upcoming digital detox. The council launched a campaign last year, called #parentech, with a website aimed at increasing the conversation and offering guidance. In a few weeks, the council will launch its digital detox — promising a “healthier digital diet”. Australian Parents Council president Ms Shelley Hill said the detox began with a self-assessment. “That has been a little bit confronting for me,” said Ms Hill. Mr Boon encouraged families to sign up for the detox and try to manage their own screen habits.